You are browsing the archive for Oracle Order Management. 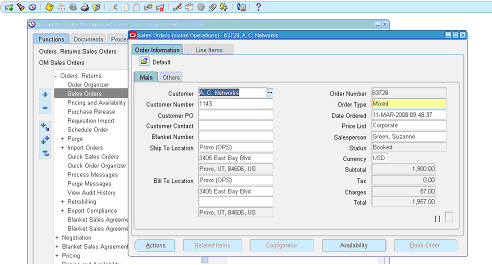 Sales Orders are the core focus of Oracle Order Management module. Sales Order will have all the details of items/goods/services requested by the customer and the due dates. 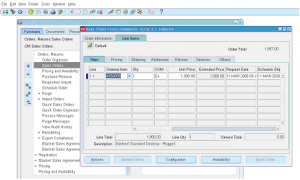 Sales Orders are entered to capture the sale of product/service. Typically sales order contain the customer, customer address, product, price and terms and conditions. 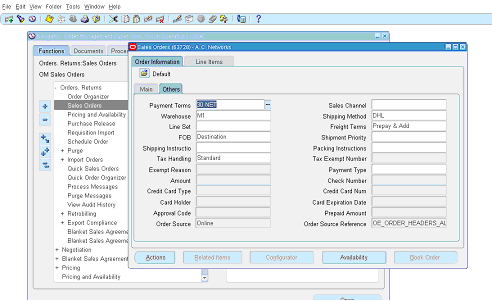 This screen opens the sales order header screen. Blanket Number if the sales order created from an existing blanket sales agreement. Ship to location – this is the address where items are shipped to the customer. Order Number – Based on setup this can be auto generated or manually entered. Price List – Determines the price for items/services ordered. Status – displays the current status, when order is entered the status will be ‘Entered’, as sales order progresses its status is updated. Order subtotal, tax, charges, total are summarized for viewing. Warehouse – Default warehouse, unless a different warehouse entered at sales order line level, the header level warehouse is used to ship the goods. Credit card type, card holder, approval code information for credit card sales orders. Freight terms – determines how freight charges are handled. Shipping priority – to mark urgent, rush, normal, slow orders. Unit price will be defaulted from price list. Click on ‘Pricing’ tab for additional pricing related information – Pricing context, calculate price flag, payment terms, sales agreement and pricing date. Click on ‘Shipping’ tab to enter additional shipping information – Warehouse, source type (internal/external), request date, scheduled ship date, promise date, planning priority, shipping method, shipment priority, freight terms, line level shipping instructions/packing instructions. Click on ‘Addresses’ tab to enter ship to customer, ship to location, ship to address, ship to contact, bill to customer, bill to location, bill to address, bill to contact, deliver to location and deliver to contact. Click on ‘returns’ to enter return order information if this order line is for returned item. 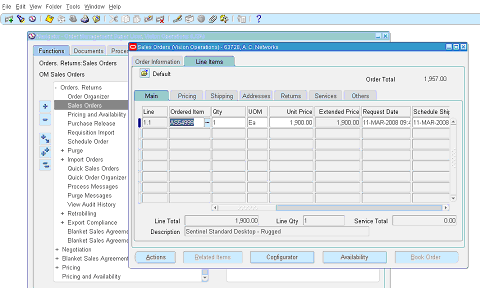 Once all the sales order information is entered it can be scheduled, reserved, or booked to process next steps.